Michael Hardacre, MD, is the Medical Director of radiation oncology at Renown Health. He explains that radiation oncology uses high-level energy to attack and kill cancer cells. Radiation is given regularly over a period of time, which allows Michael to get to know his patients both medically and on a personal level. 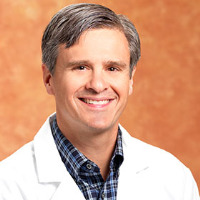 Fun Fact: Dr. Hardacre began his career in the Navy in a division called Undersea Medicine, where he worked with sailors on submarines, Special Forces, and marine reconnaissance.